Lewis Hamilton has accused title rival Felipe Massa of deliberately running into him in the Japanese Grand Prix. The two men collided as Hamilton tried to pass Massa's Ferrari on the second lap. The Brazilian was handed a drive-through penalty for the incident. "I took the corner normally and Felipe came back very aggressively and hit me," said Hamilton, whose championship lead was cut by two points to five. "I think that was pretty much as deliberate as can be." Massa denied deliberately running into the McLaren, which was tipped into a spin. Hamilton had to wait for the entire field to pass before resuming his race. "In my opinion it was a racing incident and we both paid a penalty," Massa said. "For me, he braked too late and pushed me out of the track. I couldn't stop the car as I was in the gravel and I was in the gravel because he pushed me." And he said he would not be goaded into criticising Hamilton. "I have a good relationship with Lewis and I will not do anything to destroy it. Definitely not," Massa said. "I'm not the kind of guy who brings problems on the track to the outside, and I will not change my approach." Hamilton and Massa's hopes were both hit in the incident-packed race. The McLaren driver, his car damaged in the collision with Massa, failed to score points by finishing 12th, but Massa was only able to score two points for seventh place. BMW Sauber's Robert Kubica has now joined them in the title fight - with a maximum of 20 points available, the Pole is 12 points behind Hamilton after finishing second behind Renault's Fernando Alonso at Fuji. Hamilton can win the championship in China on Sunday if he scores six more points than Massa. The incident between Hamilton and Massa happened on the second lap, when the Englishman was trying to make up ground he lost in an incident at the first corner, which dropped him to sixth. Hamilton dived down the inside into the first, right-handed part of the Turn 10/11 chicane and Massa ran wide. The Ferrari driver had his car fully over the kerbs as he went through the left-handed part and collided with Hamilton's McLaren as he rejoined the track. "I went up the inside because Felipe braked late and gave me the advantage," Hamilton said. The 23-year-old was was angry that he received the same penalty as Massa for a different incident at the first corner of the race. 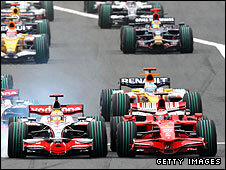 Hamilton had made a slow start and was passed by Massa's team-mate Kimi Raikkonen on the run down to the first corner. 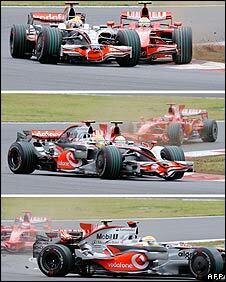 He left his braking too late, locked up his front tyres and slide off the track, taking Raikkonen with him. Hamilton damaged his front tyres enough in the incident that he would have to have come into the pits anyway, regardless of the subsequent incident with Massa. He admitted he had made a mistake - but said he did not believe it merited a penalty. "We (he and Massa) both got the same penalty but I didn't hit anybody - he did. That's just the name of the game, I guess," he said. "My personal disappointment is the start and the way I'm treated. "Everyone went wide [at the start] but for some reason I got a penalty for that. I can't understand that. "But it doesn't really matter if I agree with it, I can't change it and I just need to keep it together. "I don't think it makes any difference [to the title race]. We'll move on next week and make sure we win the last two races. "We plan on winning; not at any cost, but we plan on winning. "You can wish you did something differently but I made a mistake and I paid for it," said the Englishman, whose lead has been cut to five points. "It's damage limitation. Forget this race ever happened and move on." Massa fought his way back to finish in eighth but was later promoted to seventh, after Sebastian Bourdais was penalised for colliding with the Ferrari while racing for position. The Frenchman's Toro Rosso was on the inside of Turn One having just left the pits. The two cars touched in the centre of the corner as Massa tried to pass on the outside and the Ferrari spun. Bourdais, demoted from sixth to 10th, was mystified as to why he had been given a penalty. "What was I supposed to do?" he asked. "Roll out the red carpet?"